Honeymoon serves as the best time to spend some quality time with your spouse. It is beyond love making as this is the phase that offers you ample time to explore one another, create a mutual understanding and develop eternal love and everlasting relationship. It is just the best time to know each other’s likes and dislikes and become a perfect partner. Nowadays, it has become a tradition to for a honeymoon trip after an exhaustive session of marriage. It also offers you some time to relax with your newlywed partner. For going to a honeymoon trip, you need to select a destination that perfectly matches your tastes and interests. You can also seek the options from your partner. There are innumerable places all over the globe that can be finalized by you but this task seems a bit tricky and confusing. If you are also not able to select a destination for your honey then this article is going to help you in an effective manner. Morocco is considered as one of the best places in the world for tourism. There is a city named Casablanca in Morocco which is known by the name of Lovers paradise and is a perfect place to start your life with your beloved. Casablanca is one of the topmost honeymoon destinations situated in the western parts of Morocco and beside the Atlantic Ocean. This place is embedded with lots of surprises that can be explored by you during your trip. The rich cultural heritage and the diversity in the culture are the best that can be experienced by you. In addition to the historical sites there are several exotic hotels, resorts, shopping complexes and crafts offering everlasting memories to the couples. The couples can explore the streets of the city holding hands of their partner and experiencing the culture, amazing architecture and traditional food and clothing. There is a lot to see and admire. Some of the sites that can be visited by you are discussed below. 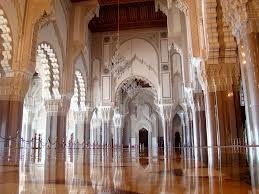 This mosque is located on the seashore and is the largest mosque of Morocco and the second largest in the world. The location of the mosque offers picturesque sightseeing of the natural wonders. The architecture of this building showcases the influence of the Moorish and the Spanish design. This place is a perfect spot to relax in the arms of your spouse. 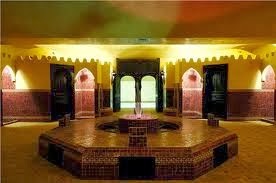 This place is also known for the Turkish bath where the couples can enjoy a full body massage and feel revitalized. Casablanca is a paradise for the newlywed couples. You can plan your trip to this place and acquire lifelong cherishing moments with your partner.